Vasudha is a new first-year living & learning community at Rensselaer. Being a living and learning community, students get a chance to study and live with other students who share their interests in the Earth, its environment, and our natural and energy resources. The students who elect to participate in this program will be encouraged (but not required) to enroll in a core seminar, IHSS-1970 Nature/Society, offered during the Fall semester. They will also have other opportunities to take courses related to energy, environment, the earth sciences, and biodiversity, including a dedicated section of Biology with greater attention to nature’s ecology. 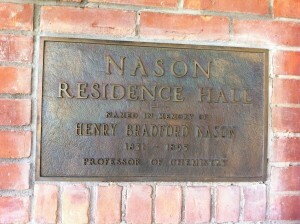 Similar to the other theme houses, all members of Vasudha will live in a common residence hall—the program is located in Nason Hall—with a dedicated lounge and classroom. The signature themes of the program are a focus on independent thought, critical thinking, and an early introduction to undergraduate research experience. We also view this as a program that can continue throughout a student’s period of study at Rensselaer, although the residential component is for the first year only. No commitment beyond the first year is necessary. All of the courses students take within the program are applicable towards graduation requirements, either as required courses or as free electives. All students in the program will be making normal progress towards their degree requirements. A living and learning community at Rensselaer focused on energy, environment, and biodiversity. As a first-year student at Rensselaer, you have the option of joining one of several new themed housing units on campus. “Earth, Energy, and Environment—The Vasudha Living & Learning Community” is unique among these communities. It is a living and learning community, where you’ll also have the option of taking one or more courses with other students who share your interests in the Earth, its energy resources, and our natural environment. Similar to other theme houses, you’ll live in a common residence hall—we’re located in Nason Hall—where you’ll enjoy great conversations with others students, and with faculty, in our dedicated lounge and classroom. One of the signature themes of our program is a focus on independent thought, critical thinking, and an early introduction to undergraduate research experience. Living and learning communities are something you’ll find at many colleges in the United States. It’s a place where you live and learn. You’ll get an opportunity to build strong friendships, even as you develop deeper wisdom and insight in a specific area of study. Because we have a close knit group of faculty members who are affiliated with the program, you’ll also get a chance to know them better. Our instructors are regular members of the Rensselaer faculty who do active research on energy, environment, and/or their relationship to society. With Vasudha, you’ll also find many opportunities to participate in—and organize—extra-curricular programs and activities. While these activities may vary from year to year, they have included field trips to the Darrin Fresh Water Institute, the historic Erie Canal, and the diverse ecosystem of the Rensselaer Plateau. We also sponsor a lecture series each year on topics such as global warming and climate change. Its not a major… Who’s it for? 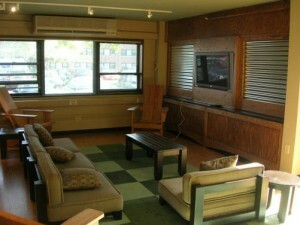 The lounge in Nason Hall, the center of the Vasudha Community. This living & learning community is designed for all new first-year Rensselaer students, as well as second-year students who choose to stay with the program. There is no requirement that you take a Vasudha affiliated course, although we encourage students to take the core seminar, IHSS-1970 Nature/Society, since this will give you an opportunity to connect with other students. In the fall semester, you’ll also have the option of taking a common section of BIOL-1010 Introduction to Biology, with an expanded focus on ecology. Basically, this approach works because we consider Vasudha to be an interdisciplinary program where mechanical engineers, biologists, architects, and others can work together to learn about, and solve the complex problems related to the Earth’s environment. Thus, whether you’re studying Environmental Engineering, Finance, or Communications, or are interested in Law or Medicine, all of the work you do outside of the program contributes to what you learn within it. This is the goal of “integrating” knowledge that stands at the heart of our vision for our living and learning community. Participating in Vasudha will not interfere with your ability to complete any degree program at Rensselaer within the normal four-year period (five years for Architecture). Most of the courses you take will fulfill institute requirements; most courses you take in your first year will contribute to your defined major.